...basking under my yellow sky...: 99 Bottles of Beer On The Wall - & Then Some! 99 Bottles of Beer On The Wall - & Then Some! 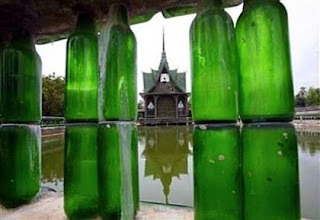 Buddhist monks from Thailand’s Sisaket province collected one million bottles to build the Wat Pa Maha Chedi Kaew temple. 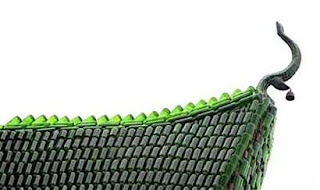 They used a mix of green Heineken and brown local Chang beer bottles. They started collecting the bottles in the 1980’s, and over time had acquired nearly a million of them. 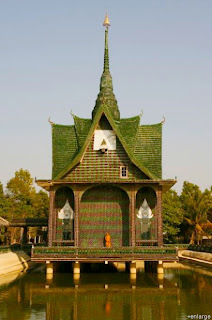 They decided that something had to be done with them, and that using the bottles as a building material seemed the perfect solution. After asking local government agencies and citizens for more of the bottles, they were able to product 1.5 million, and got to work. 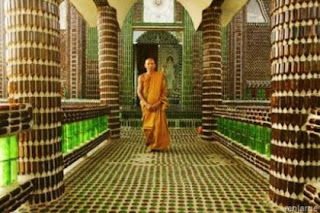 The result was a large complex with a main temple, guest bathrooms, prayer rooms, a tower, a crematorium, and more. 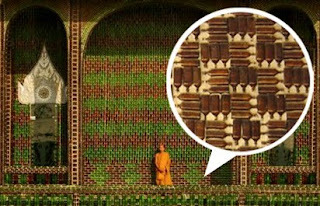 They even created vast mosaics of Buddha out of the collected beer caps. They hope to continue with the project. “The more bottles we get, the more buildings we make,” Abbot San Kataboonyo said. Once again, proving Alex Steffen’s point that there is no such thing as garbage, just useful stuff in the wrong place!